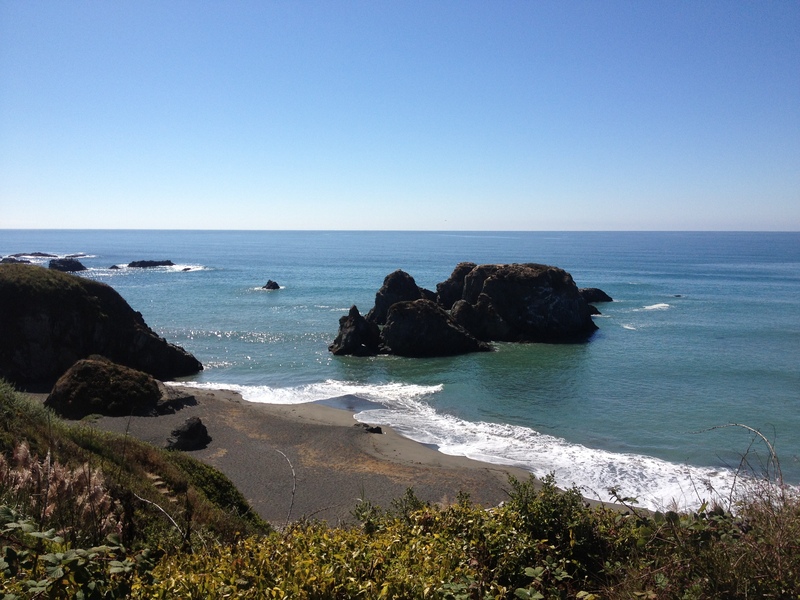 The Pacific Coast near Mendocino, California from Hwy 1 on a clear February day. It has been a long strange winter this year in Maine. It started early when our first significant snow storm arrived just as the trick or treaters had finished their rounds on the last day of October. While they snuggled into their beds with thoughts of the sugary bounty they collected dancing in their heads, the snow began to fall silently to the ground outside. A few more storms in the next couple of weeks, brought a total of more that 26 inches of snow to our part of the world, long before winter even appeared on the calendar. Most of that snow had disappeared by the beginning of December and things were relatively warm and dry until the end of January, when the dreaded Polar Vortex and Bombogenesis combined to make the past 31 days the snowiest on record. And it’s just not the snow, temperatures have not been above freezing for over a month now and wind chills have been as low as -22 degrees. Thankfully there is a light at the end of the tunnel. And no, I’m not referring to the arrival of spring next month. If I have learned anything from my eight years living in Maine, it is that Spring is far from a guarantee of a return to more temperate weather. Even if that were the case, all this snow is going to take a good long time to melt. What I am referring to is a temporary change of scenery. A trip out west to visit our son in Northern California where temperatures have been in the 50s and 60 this month with nary a flake of snow. This will seem practically balmy to us and I will be packing my suitcase with t-shirts and shorts, hoping to get a bit of sun on my winter white Maine legs and arms. It will be nice to step outside without having to bundle up in jacket, hat, gloves, and scarf. Socks and boots will be optional. On the drive up from San Francisco, we will stop in Calistoga for mud baths, massages, and the Olympic-sized natural hot springs pool at a casual resort we discovered while living in California years ago. When we arrive at our son’s home, we likely will have the opportunity to take a hike in the Coastal Redwoods, walk along the uncrowded beaches of the North Coast, and see some of the spring flowers that are already beginning to bloom. More importantly, we will be able to spend some time with our son in a place he has called home for the past three years. Next year, the trip will be a bit farther and may not provide the dramatic difference in climate as he will be relocating to Kodiak, Alaska for a new job assignment. Still, believe it or not, average temperatures are higher and snowfall less in Kodiak in February than they are in Maine. We will not have the easy opportunity for the side trip to the mud baths and etc, but the change in scenery during the middle of a long, cold winter and the chance to spend some time with our son will definitely give us something to look forward to. And I think everyone can benefit from that. This entry was tagged Alaska, Bombogenesis, California Redwoods, Change of Scenery, cold, North Coast, Polar Vortex, snow, snowfall records. Bookmark the permalink.